At an early age, it is difficult to teach children about money. Learning comes much more easily when it is fun. Game nights are a family tradition in many households and throwing in one of these board games can combine fun with a little financial education. 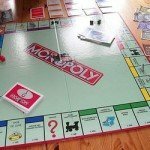 The board games provide the basic concept for what most people are trying to do in life, financially. Sure, the game play is all about whoever has the most “money” and it encourages competition but the methods for winning these games is identical to how we obtain wealth in real life. Monopoly is THE CLASSIC. Players take on the role of a real estate investor. Buying, selling and trading what you have to gain leverage over other players in the hopes that they lose everything they have. Lessons of the game include knowing which properties to buy, sell and trade, managing your money so that you have enough to do certain things such as build houses or pay rent, and learning the art of negotiation. The goal of LIFE board game is to undergo numerous life decisions so that the player ends up with most money wins. Here, players can learn the importance of a career choice and an education. The game has spaces on the board where life events, spontaneous and expected, occur which would then lead a person down different paths. LIFE will teach that the decisions one chooses early in life will have a major impact on the distant future. Without a doubt, Pay Day board game is ideal for the practice of personal finance and good money management. The game has a “calendar” board and players earn money and experience different events every day that may allow them to gain or lose money. Because there are savings accounts and loans in the game, players can learn the art of budgeting and the dangers of borrowing money, which are the most talked about topics in the personal finance blogosphere. After playing this game, it would be a good idea to give a piggy bank to the kids when the concept of saving money is fresh in their mind. Along with fun and money lessons, the games can improve mathematical skills and promote maturity. Many parents, who feel like they need to teach their children a little more about finances but also find it uneasy to introduce the topic, can use these classic board games to establish a sound financial mindset for their kids. These board games are not just a great educational tool for younger generations but it can also serve the same purpose for everyone of every age. Children’s Allowance: When to Start and How Much to Give? How is Your Money Smarts? Simon Zhen is a recent college graduate and the founder of Realm of Prosperity, a blog where he writes about all things regarding personal finance and much about college finances. Give his website a visit and subscribe to his feed if you enjoyed this post! Fantastic article. Since we had children we’ve done quite a bit of research into fun ways to teach them about money. We’ve found a number of sites but the most interesting we’ve come across recently is teachchildrenaboutmoney.com. Glad Life made the list. That was another great one. Another great board game is Stock Market. My family has played this since I was little. It shows how some people make money while others lose. Great game but very hard to find. I have found that making personal finance fun and exciting works pretty well. I recently got my teenage son an iPhone, and set up money tracking account. After every month, we go over his spending, and if he is within his set budget, I tack on $20 extra spending money. If he goes over, I take away $20. He finds it challenging and rewarding – plus, it makes him cut down on superfluous spending. The service I use is called smallspend, but you can teach kids money management with other tools as well.